Nestled among Italy’s Dolomites rests a stunning new retreat designed by Peter Pichler Architecture and architect Pavol Mikolajcak. The Oberholz Mountain Hut takes cues from the landscape, fitting into the surrounding natural beauty like a fallen tree. One glance at these photographs will leave you yearning to jump on a plane to Italy to explore the gorgeous wooden restaurant. 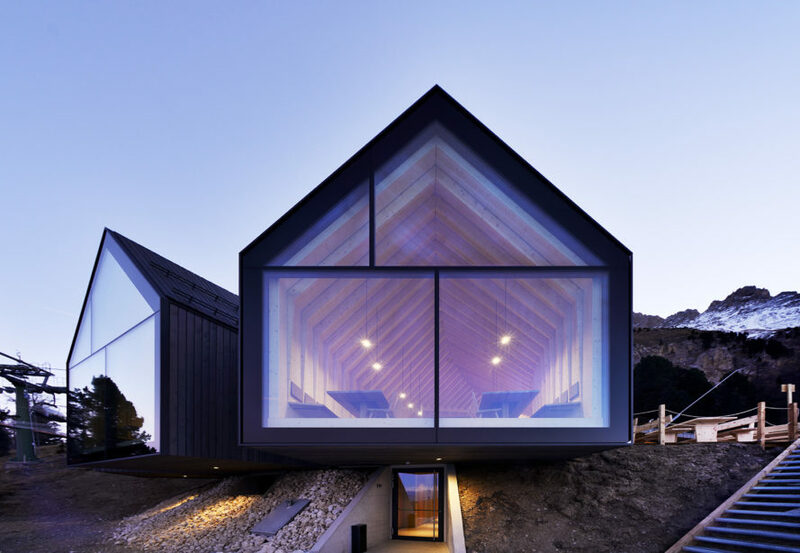 The cantilevered building sprawls out from the mountain, providing visitors with breathtaking views. Three wings span out from one structure like three tree branches, “creating a symbiosis with the landscape,” in the words of Peter Pichler Architecture. The sloping roofs offer a nod to local hut design. 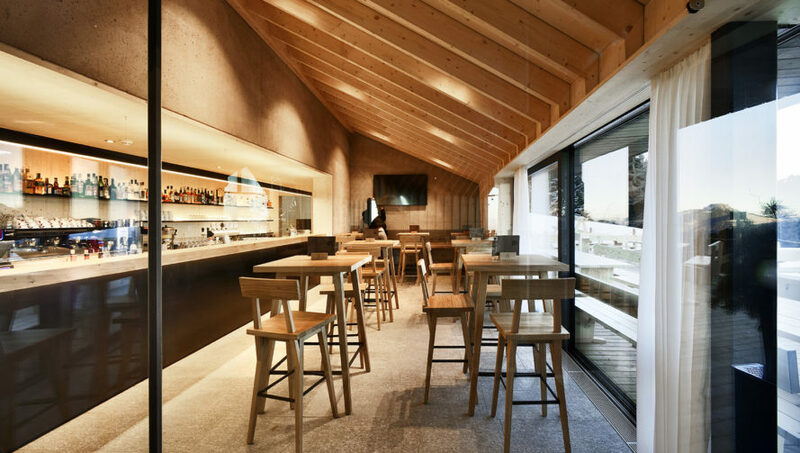 The Oberholz Mountain Hut is situated right next to a cable station at the Obereggen Ski Resort, so visitors can hit the ski slopes and then return to the hut for a meal in the intimate dining space or a drink in the cozy bar near the entrance. The stunning interior is matched by a spacious outdoor terrace filled with more tables for dining and relaxing. 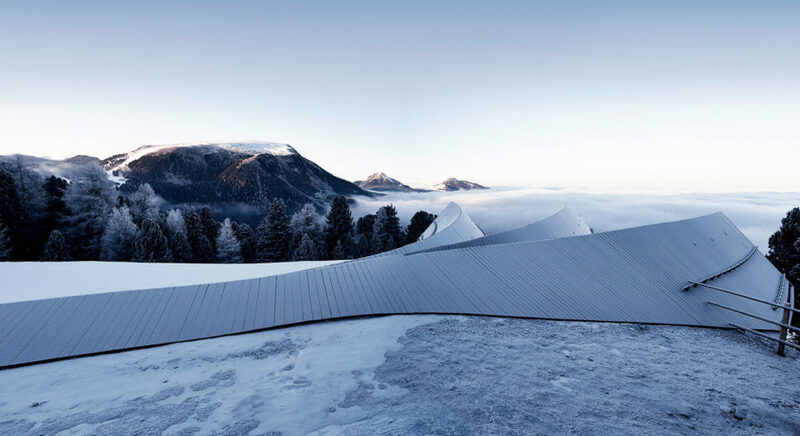 Peter Pichler and Pavol Mikolajcak designed the Oberholz Mountain Hut after winning a 2015 competition. The restaurant is now open to visitors. 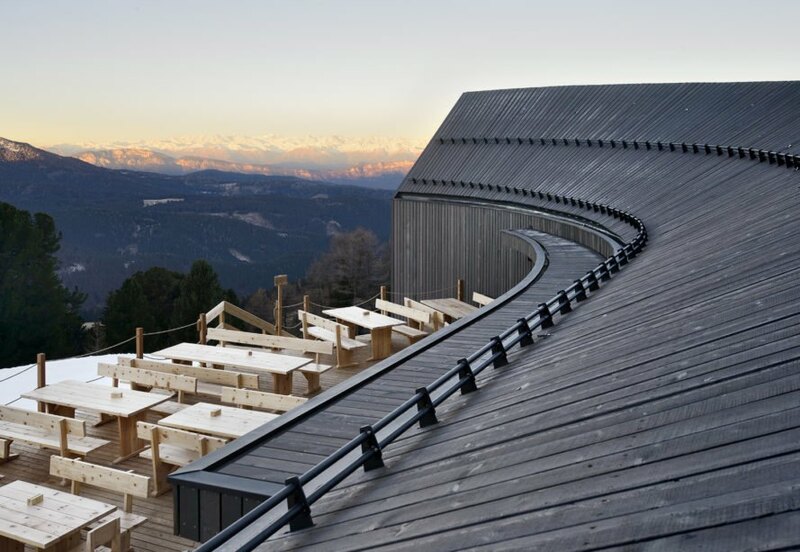 Nestled among Italy's Dolomites mountains now rests a stunning new mountain hut designed by Peter Pichler Architecture and architect Pavol Mikolajcak. The Oberholz Mountain Hut, which is located near the Obereggen Ski Resort, takes cues from the landscape, fitting into the surrounding natural beauty like a fallen tree. One glance at these photographs will leave you yearning to jump on a plane to Italy to explore the gorgeous wooden restaurant. The structure is reminiscent of a fallen tree. Massive windows provide breathtaking views. The glass facades face peaks to the southwest. Gray larch wood adorns the outside of the building. Guests can dine at a spacious outdoor terrace. A snug indoor restaurant allows guests to relax after skiing or exploring. The structure pays homage to local hut design while still offering a contemporary interpretation with a sleek modern interior. Oak furniture can be found inside the mountain hut. Guests can also relax in a bar near the entrance. According to Peter Pichler Architecture, the Oberholz Mountain hut creates "a symbiosis with the landscape." Nestled among Italy's Dolomites rests a stunning new retreat designed by Peter Pichler Architecture and architect Pavol Mikolajcak. The Oberholz Mountain Hut takes cues from the landscape, fitting into the surrounding natural beauty like a fallen tree. 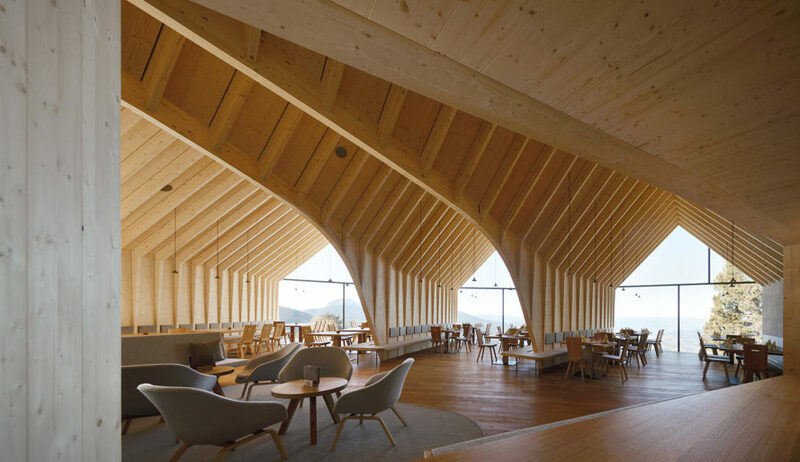 One glance at these photographs will leave you yearning to jump on a plane to Italy to explore the gorgeous wooden restaurant.